Welcome! I've written this page specially to give visitors to my website from the USA and Canada some ideas where to get further information about creating a backyard pollinator habitat. It doesn't matter what size your garden is - Even small city yards can make a difference. Your soils, climate and native wildlife are significantly different to those here in North Western Europe, so information on wildlife gardening intended for British gardeners will not always be relevant to your conditions. The general principles of garden management listed on my Gardening for Nature page do apply to you. Plenty of plant ‘structure’ to give your garden a variety of mico-habitats, leaving some dead stems and seedheads over winter, and not using pesticides - all this applies to you too. However, when choosing plants that are suitable for your region and appropriate for your local wildlife you need to seek local advice. Many of the plants recommended for wildlife gardens in Britain and Ireland are not suitable for North America. For example, several well-behaved European wild flowers that are often recommended in the UK as bee and butterfly plants are highly invasive in North America. On the other hand, there are many scarlet, trumpet- shaped flowers that are of little or no use to wildlife here in Europe, but are grown in North American gardens as they will attract hummingbirds. (We don’t have hummingbirds in Europe). Noah's Garden: Restoring the Ecology of our own Backyards. Marinelli, Janet: Stalking the Wild Amaranth: Gardening in the Age of Extinction. (One of my favourite books - should be compulsory reading for every gardener). Buchmann, S, and Nabhan G P: The Forgotten Pollinators. Shearwater Books, 1997. ISBN 155963 353 0. (A "good read" - not at all dry or boring - another of my favourite books). Holm, Heather: Pollinators of Native Plants. Attract, Observe and Identify Pollinators and Beneficial Insects with Native Plants. Pollination Press, 2014. 306pp. ISBN 978-09913563-0-0. 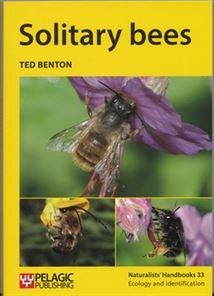 I highly recommend this book - it has lots of useful information about insects, flowers and their geographical distribution. Sierra Club Books, 1998. 208pp. ISBN 0 87156 975 2. Sponsored by the Xerces Society and the Smithsonian Institution. Native Plant Gardening and Invasive Plants Guide, with links to plant lists by state. A leading organisation concerned with the protection of invertebrates and their habitats. This site has useful and topical information about all kinds of pollinators. A campaign in the USA to register a million public and private gardens and landscapes to support pollinators, in collaboration with the National Pollinator Garden Network. Has a link to a pollinator-friendly planting guide for your region if you live in the USA, and details of the annual National Pollinator Week. A site from University of California at Berkeley with lots of info about planting your garden to encourage wild bees. An interesting garden (open to the public) with a good downloadable plant list for the Western USA. Many of the plants on the list will attract other pollinators, not just honey bees. An attractive, slightly more scientific site from the Arizona-Sonora Museum explaining the ecological role of pollinator species that migrate with the seasons. Solitary Bees and wasps in your own back yard. A page from the University of Florida with useful info about managing bee blocks. "Resonating Bodies” is a series of integrated media installations, community outreach projects and educational initiatives which focuses on biodiversity of pollinators of Canada, with special focus on the city Toronto.